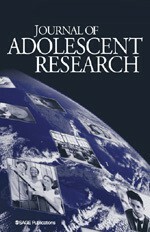 For more than 20 years, Journal of Adolescent Research (JAR) has been the must-read publication for all academics, practitioners, policy-makers, and journalists interested in a global perspective (not just North America) on adolescence (ages 10-18) and emerging adulthood (ages 18-25). Articles are emphasized that combine both quantitative and qualitative methods, use a systematic qualitative or ethnographic approach, break new theoretical ground, or use a new methodological approach. The Journal of Adolescent Research also includes book reviews, and a new column called “Editorial Essays,” in which a prominent scholar will discuss an important issue in a looser format than the rest of the journal (opinion pieces, commentary, and wit & wisdom). The aim of Journal of Adolescent Research is to publish lively, creative, and informative articles on development during adolescence (ages 10-18) and emerging adulthood (ages 18-25). The Journal encourages papers that use qualitative, ethnographic, or other methods that present the voices of adolescents. Few strictly quantitative, questionnaire-based articles are published in Journal of Adolescent Research, unless they break new ground in a previously understudied area. However, papers that combine qualitative and quantitative data are especially welcome.